OTANO Sketch Panel & Smart Tools - Welcome to TVPaint Community forums ! I also included 3 scripts from Svengali (tweaked a little). - A toggle cutbrush button that activates the cutbrush and toggles between the different cutbrush shapes when you click again. Then you cut your brush manually, and when you click again on the button it stamps in place you custom brush and goes back to your old brush. - Svengali's awesome toggles for transformation tools. One click to activate the transformation, one click to apply and go back to brush. I tweaked it to clear selection as well. Just don't forget to set their antialiasing mode to none to still work without anti aliasing. - A toggle mode button, that it universal to every tool (even transformation tools). 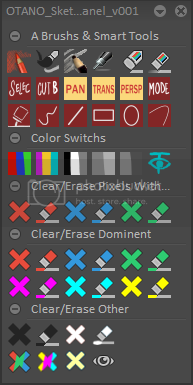 For brushes it toggles between color, behind and erase modes. - A smart bucket button : you click once it toggles the bucket tool, you click again it fills the entire frame if it's empty, it colorizes non-transparent pixels with your current A color if it's not. Then it goes back to your tool. - A set of tool toggles. You click once and you activate the tool, once again and you activate it's filled homologue. If you shift click it also activates alpha (when you need to change the color of a stroke for exemple), if not it desactivates alpha. - Simple color toggles, you can edit the script to change them if you want. They are not fully saturated colors so you can read them better when playing you animation, but they still work with my clear/erase buttons I really wanted to be able to use darker colors. The first button toggles primary colors, the second secondary colors and the third toggles black/white/grey. - Buttons to erase pixels that contains a given RVB color, even in little quantity. (those buttons work with antialiased pixels, so you can use them to isolate any color with a given channel set to 0. Clear buttons are applied to all the frame, the erase buttons just change the mode of your current tool so it erases the chosen pixels but you can still use the same tool. - Those buttons are quite different from TVPaint's buttons on their sketch panels. They have kind of a flexible range and will never leave transparent pixels. It's 255 or 0 Alpha, depending on the button. If you have a really dark red for exemple, the red buttons will still erase it, as long as R in the higher channel in our RVB color. For secondary colors, it works by pairs : you color has to have two color channels that are high enough to be able to use the buttons. Talking HSL, usually the buttons work well your "S" is above the middle, for "L" you can do whatever you want for primary colors but it has to be high enough for secondary colors. For "H" it depends on the proximity with the button's color. - A line of buttons to clear/erase perfect black or non-perfect black without any remaining transparent pixels. - Some other color tweaks. You can erase only primary or secondary colors, or all saturated pixels (this last button is usefull cause you can use grey colors). - The TVP "black preview" shortcut. Don't hesitate to put shortcuts on those buttons, it's quite handy (especially the tool toggles to save some keyboard space for other shortcuts). Last edited by NathanOtano on 11 May 2016, 20:23, edited 1 time in total.